A good, beautiful and well-equipped kitchen will make spending time in it much more enjoyable. For most people, having a beautiful kitchen is just a dream; both getting a new kitchen and starting a kitchen remodeling project are just too expensive. In reality, however, making your kitchen look beautiful and expensive is not as difficult as you think. These next few tips will help you get started with some (DIY) projects with amazing results. Nothing makes a kitchen more beautiful than a nicely finished wooden floor. Laminate flooring, especially in a lighter tone, can help add more light and warmth to a kitchen. Paired with a simple white wall on one side, big windows on the other and some gorgeous cabinets and countertops, you will have the perfect kitchen. Unfortunately, matte wooden flooring tends to be more suitable for low-activity areas. It scratches more easily and is definitely not made for kitchens. Worry not, because we have several solutions you can look into. You can start by trying vinyl instead of real wood as your material of choice. 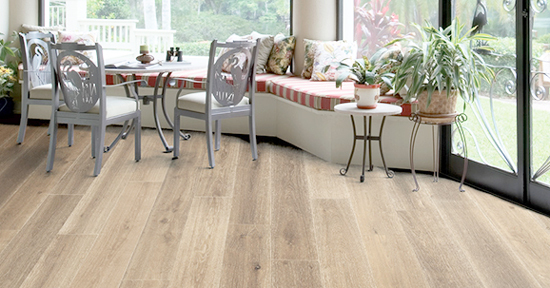 Vinyl flooring has gotten so good that we now have extremely realistic options to choose from. If you already have wooden flooring in place, refinishing the kitchen floor is another alternative to try. Look for Tung oil for wood and you can achieve a gorgeous matte finish while adding better durability and protection to the wooden floor. Real Milk Paint has a number of Pure Tung Oil products at amazing prices. Changing the cabinets you use around the kitchen is another great way to spice up the room and add a new look to it. There is no need to spend a lot of money on new cabinets either, because there are plenty of ways to repurpose your existing ones. It is even possible to change the layout of your kitchen completely through some DIY projects involving old kitchen cabinets. There are, however, a few things to keep in mind if you want to make your kitchen look expensive. First, limit the number of colors you use. Instead of having multiple shades of wood finish and patterns around the kitchen, stick to simple and light colors such as white or grey. The same can be said for the kitchen countertop. There are kits that can help you repurpose kitchen countertops or simply repair and re-laminate your existing countertop to restore its beauty. The simplest way to make a kitchen look expensive and amazingly comfortable? Add more light. Try to let as much natural light as possible into the room. Use daylight LED bulbs to add more light of the same tone and color as natural light. Focus on concealing the light sources you have around the kitchen while still letting the maximum amount of light fill the room. A bright kitchen is always a nice place to spend time in. Combined with the previous two tips we covered earlier, more light can really change the way your kitchen looks for the better.